As the sun slowly rose above the eastern horizon, peeking through the streets and alleyways of Long Beach, the sky began to turn a purplish-blue. 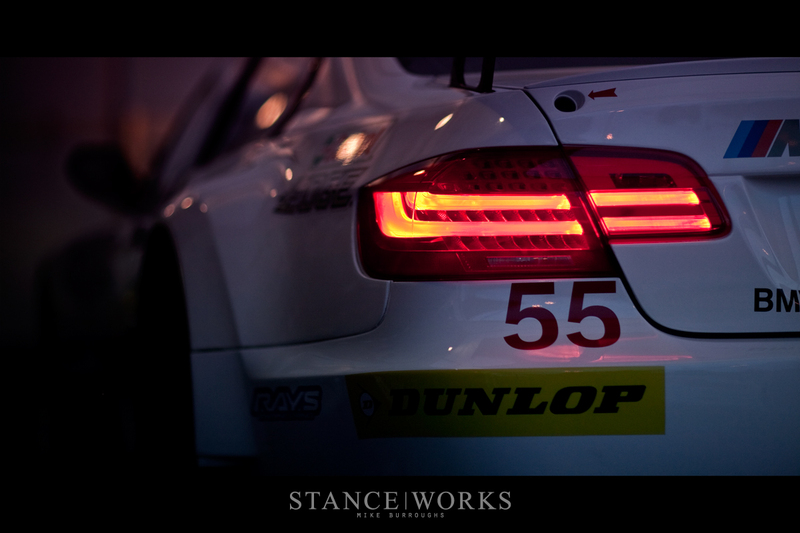 A soft ambient light draped the paddock, accentuated by the bright red highlights of illuminated tail lamps. A crew of men dressed in blue and white pushed a pair of white purebred race cars out from the upper level of the transporters and slowly lowered them to the ground. 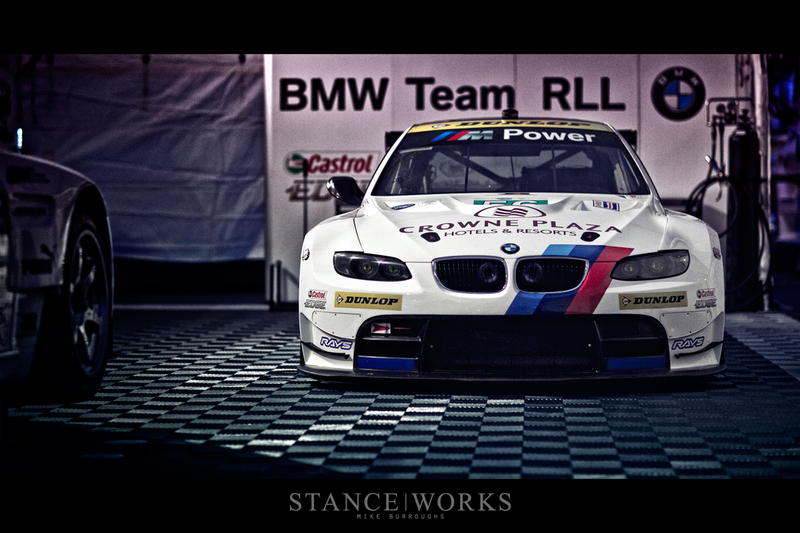 It was the day before race day, and BMW Team RLL brought a force to be reckoned with. 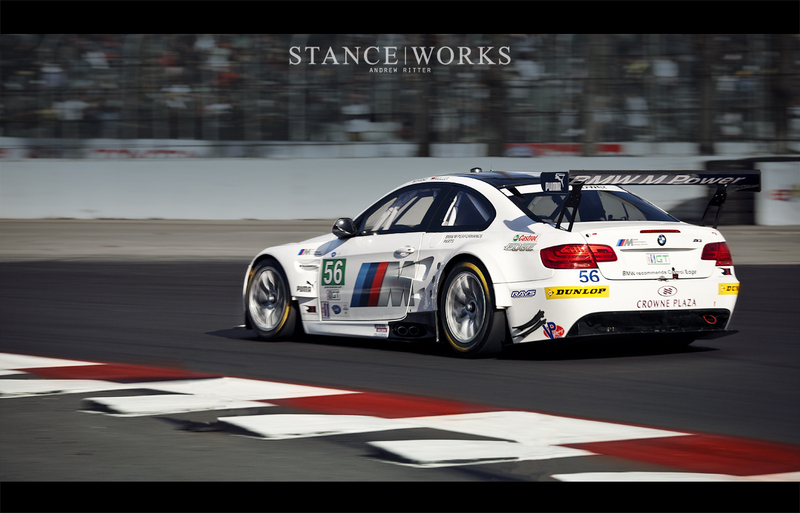 GT Class champions two years running, the 55 and 56 American Le Mans Series M3s were fired up. The sleeping giants were awakened and ready to take on the streets of California once again. 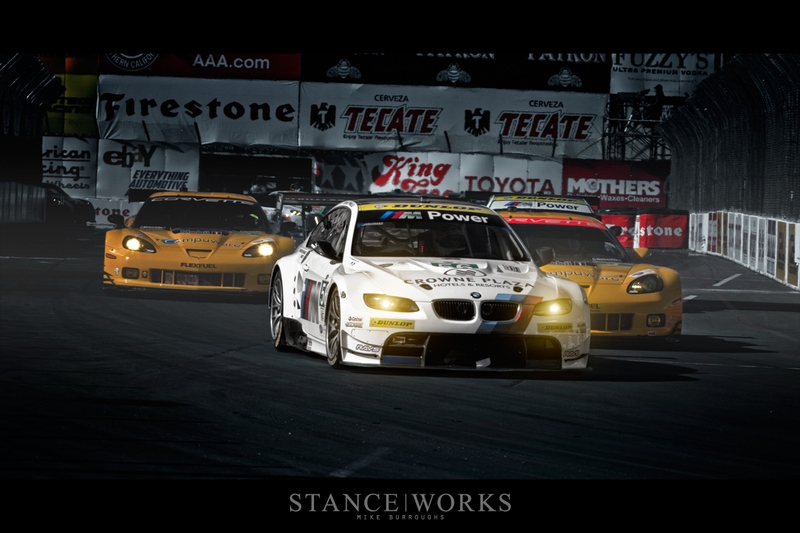 In March, I received a call from Bill Cobb on behalf of BMW, inviting us to join Team RLL for their race in Long Beach. As official guests of the team, Andrew and I were given media credentials and full access to the team trailers, paddock, pits, and track; an open invitation for us to do what we do best, and this time, for a group we've idolized since our adolescence. Our work began early; a frigid Friday morning at 5:00am to be specific. Andrew's and my arrival at the race track was met by a setting reminiscent of the eve of Christmas. Our excitement was at its limit, and before us, the pinnacle of GT cars sat, taunting us as though its presence was a gift. The team assembled their paddock, a mobile garage that rivals that of most established shops. Just twenty or so feet wide, the ALMS stallions rested within the confines established between the trailers that brought them. The metallic hardtops of toolboxes served as workbenches, and the myriad of spare parts and pieces were stored within the nooks and crannies of the haulers. The cars were pushed in to their temporary home, nose to nose, and the air jacks were filled, hoisting the cars almost a foot off the ground. 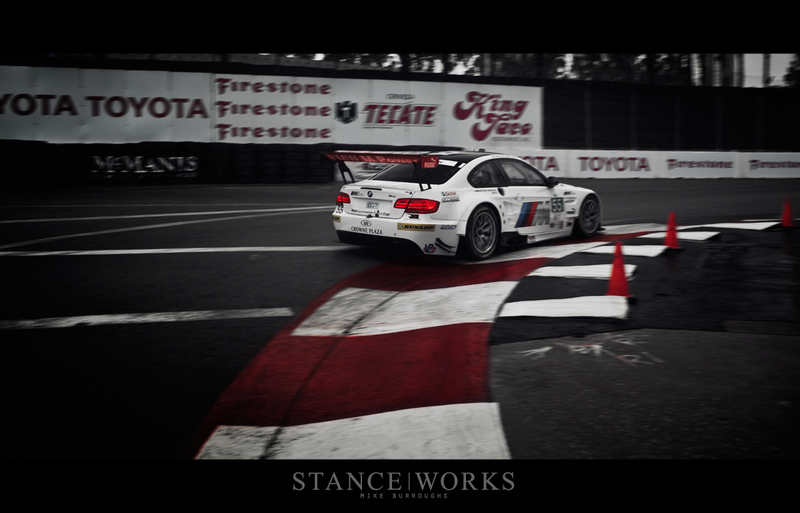 The preparation for track testing began before Andrew and I could even gain our bearings. The clinking of wrenches was drowned by the screams of the engines as they were revved, tuned, and analyzed for the coming day. 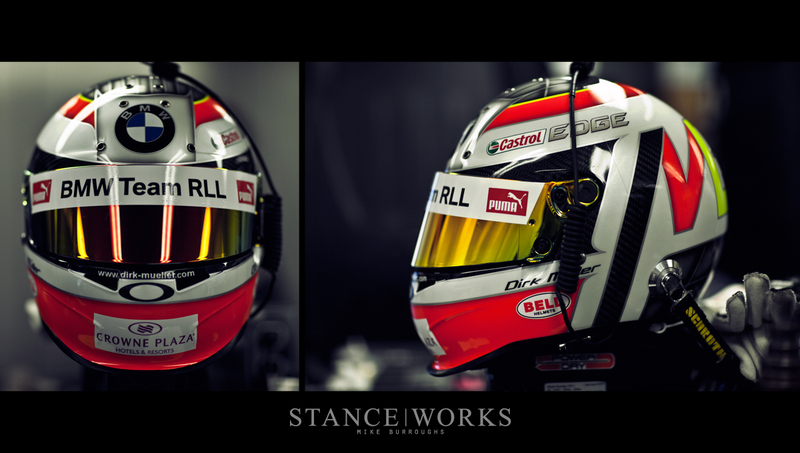 As the team readied the cars, it was my first chance to truly admire the machines that sat before me. As a car that I thought I'd never spend more than a fleeting moment with, I found myself marveling at the intricacies of the brute. Every component of the car flowed in to the next with a seemingly organic nature. 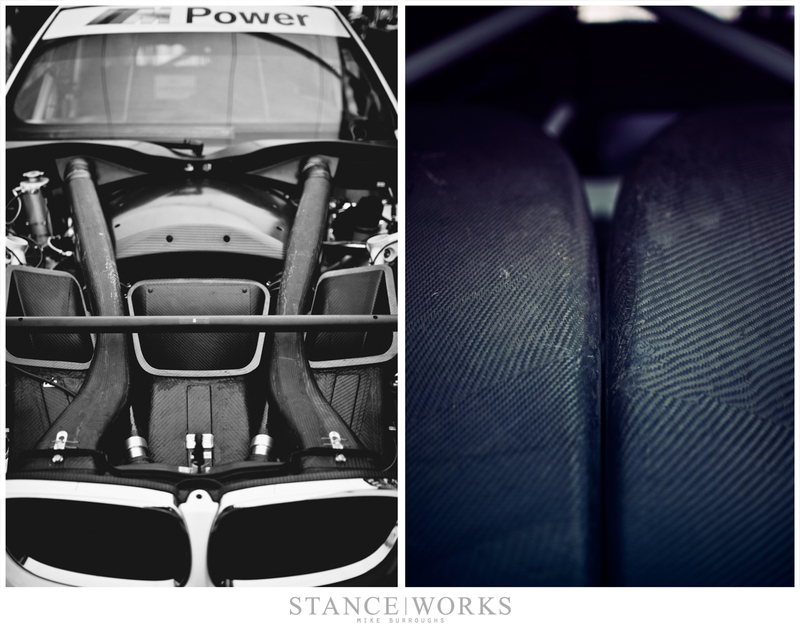 Carbon fiber was in abundance, nearly every piece and panel composed of it, keeping the car's mass at a minimum; just shy of 1300 kilos (2800lbs). The car was modular, every panel almost instantly removable for pitstop fixes. Every wire joined another with a twist-quick-connect fitting, and the components that brought the car to life seemed to pop on and off. The crew wrapped up their changes and adjustments, and the cars dropped back to earth with a satisfying shriek of escaping air and a welcoming thud from the tires making contact. The sun had risen but was masked by the gray clouds that had moved in off the coast. The skies grew darker and the clouds let loose. The rain hit the tarmac, and the day's practice session, a single, vital chance for teams to acquire any last minute info about the track conditions and the car's temperament, was going to be a wet one. 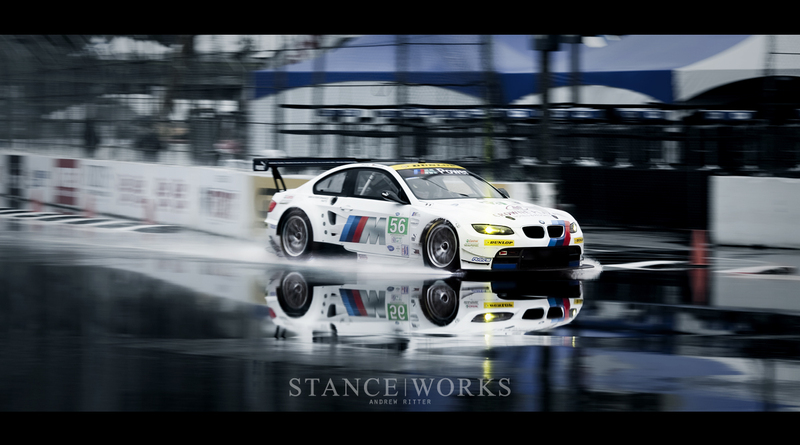 The Californian streets were slick with a solid sheet of water; cars skated over top the slippery surface as they decided whether or not to push the cars in an effort to educate themselves for race day. Our BMWs could be heard screaming over the rest of the field, including the LMP prototype cars that occupied the track at the same time. 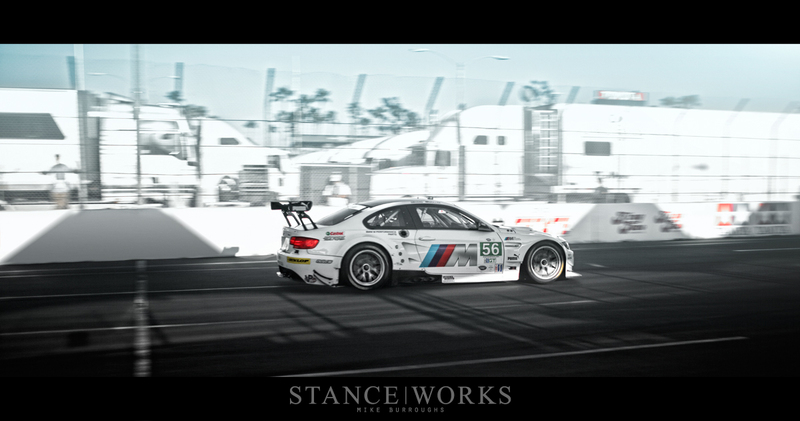 The familiar raspy screams of BMW's engines ensured we never missed their passes. Only a fence separated us from the cars as they flew past at speeds well into the triple digits. The cold mist of the water thrown in the air off the treaded r-comp chilled any exposed skin as they passed; the waterlogged track was a dream come true. Not for the drivers and race teams, but for photographers like myself; setting a tone and ambiance that is unrivaled by the sunny skies we had come expecting. The rain fell hard and beaded on the front of my lens, smearing as I wiped it away. My cold fingers began to move slower and slower, and continuously wiped the water from my face. I stood soaked from head to toe, gripping my camera with one of the most sincere smiles I've ever had. 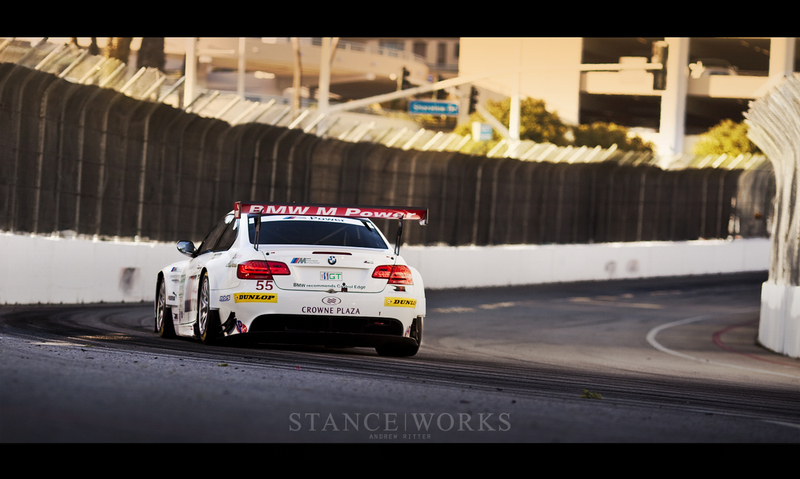 BMW is no foreigner to the streets of Long Beach. With several years of data under their belt, they needed to gather little information to prep them for the following afternoon. The weather was supposed to be clear, so the test runs offered little in the way of help. However, the 56 car, driven by Joey Hand and Dirk Müller, wasn't functioning properly, and the test time on track was utilized to sort out the issues. 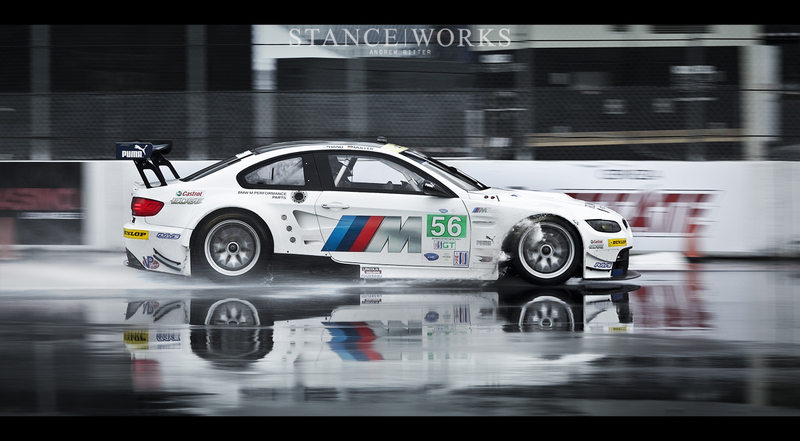 Team RLL was one of only a few teams willing to put their car on the track during the downpour, pitting their machine against the slick asphalt, risking it all in the name of winning. What time isn't used to its advantage is only wasted. After returning to the paddock, the team discovered a misfire in the engine. The solution to the problem came in the form of a new wiring harness for the vehicle. The crew put every foot forward to fix the issue in a mad-dash for qualifying late in the afternoon, and finished the task without issue. The afternoon was down to a waiting game. Qualifying seemed on the fence; the administration could choose to grid the cars based on current point standings, as many of the teams argued that it wasn't worth risking the vehicles in the rain. 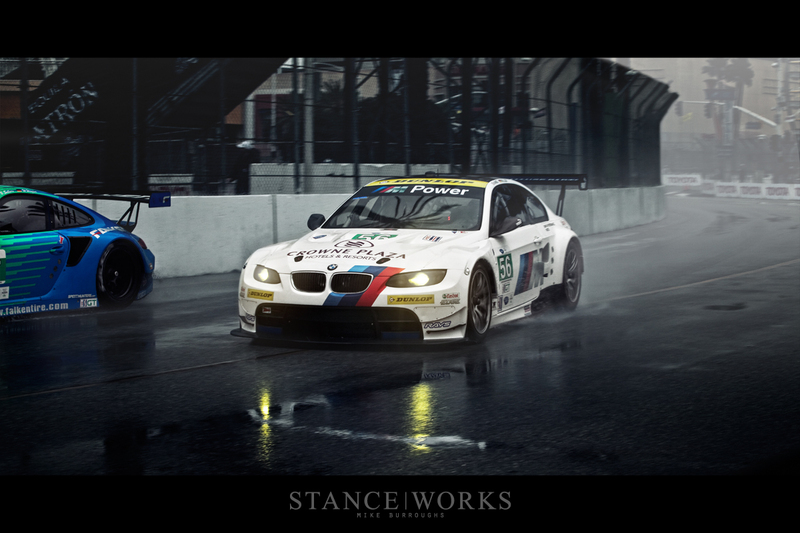 BMW, however, pressed on, preparing to take the challenge head on. If qualifying occurred, they'd be ready, and if not, pole position would be theirs in any case. Being a winning team has it's perks. The cars went out for qualifying, each aiming to set the fastest lap time in the minuscule 15-minute on-track session. Just a few laps in, however, officials called it off. The rain that had seemed to dissipate made a spirituous return, soaking the track once again. Round Two of ALMS would come down to point standings, and Team RLL would have their pole position start as expected. The cars were brought back to the paddock and cleaned, prepped to be put in the trailers where they would lie in wait for the day to come. 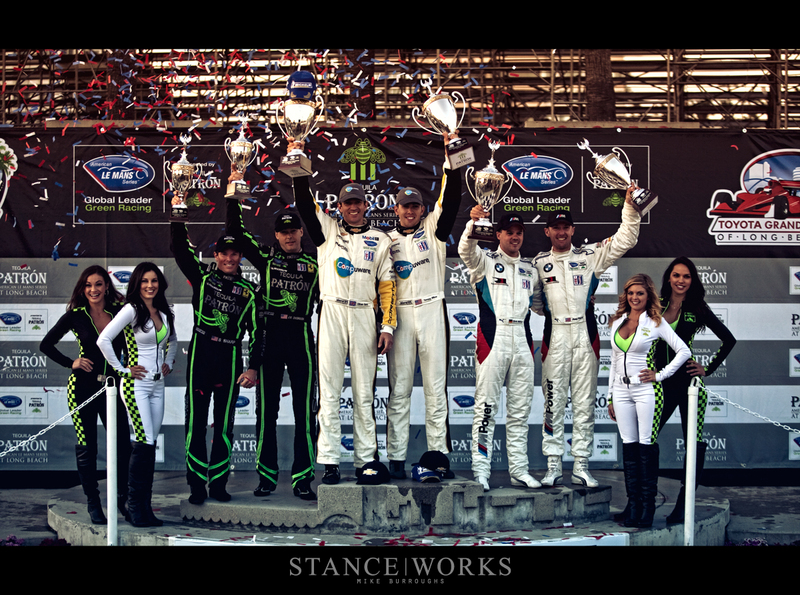 The team's confidence was as high as possible, knowing that with some of the most experience in the field, and with some of the best drivers imaginable, they were ready to take on the competition. The end to the long, cold day came far too quickly, yet tomorrow would bring the spirit of the track to full heart-beating life. Day Two came just as early; a photographer's meeting was held at 6:30am. After the briefing, more than one hundred photographers headed to the track to plan out their attack on the day ahead of them. The race would begin in just 10 hours: an eternal wait doubling as a clock spinning far too fast. After taking the win at the first race of the season, 12 Hours of Sebring, BMW Team RLL needed every spare second to ensure a win the second time around. 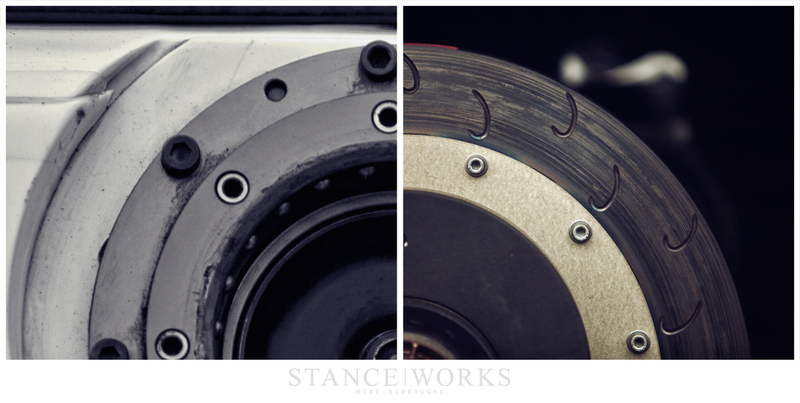 Alignments were performed on both cars using the tried and true string-method paired with the finesse of calipers and proper equipment. 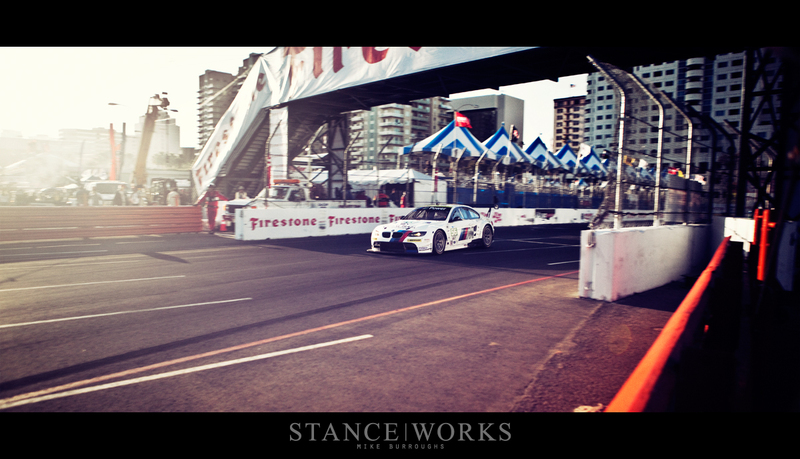 The Dunlop slicks were mounted to the alternate set of BBS wheels, and the cars were given a thorough once-over. Practice runs were behind them, and everything done from this point forward was make-or-break. It was "all hands on deck" in the final moments before the cars hit the grid. 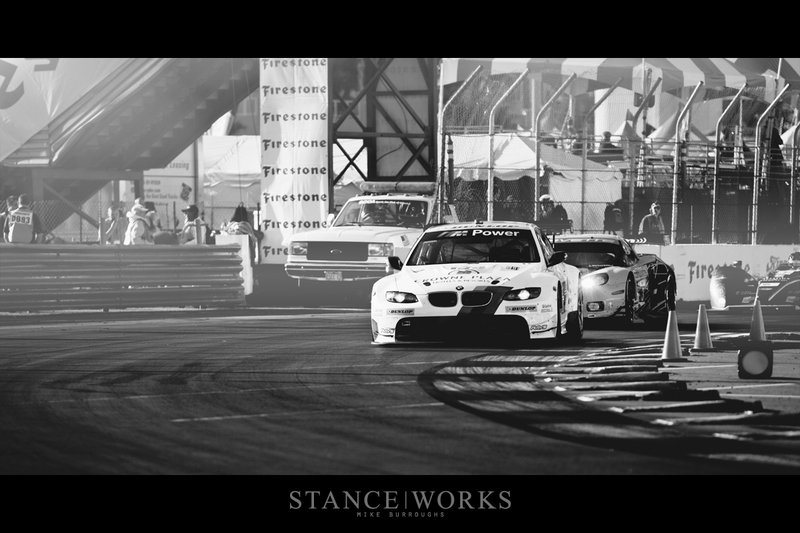 The cars were off, and as hoped, the BMWs rounded corner number 9 into my sight, leading the pack. Unfortunately, the 55 car only made a single pass before it went missing from the pack of LMP cars and Corvettes it was previously mixed with. Jörg Müller was bound up in traffic on the race track, resulting in an accident on the second lap. The car was pitted and the crew made quick work of the repairs, replacing the radiator and removing the hood to get the car back out on the track. Sadly, Jörg was 13 laps down from the leader: a nearly impossible gap for him and his teammate, Bill Auberlen, to close. However, Jörg put the pedal down and pushed through, setting some of the fastest lap times of the day. All went well until the 16th lap when a prototype collided into the back of the 56 car, and it's driver, Joey Hand. The impact punctured the right-rear tire, causing Joey to pit early as well. After refilling the fuel tank and replacing all four tires, he was back on the track in 7th place. The boys went at it hard, the screams of their cars louder than ever before, pushed to 10/10ths and sharing paint samples with fellow Corvettes, Porsches, and Ferraris as they fought their way to the front. Andrew and I settled in, snapping as fast as possible each time the BMWs came whizzing by. He took the back half of the track while I covered the front, maximizing our coverage and ensuring we'd make as much use as possible of the very short 2-hour race. The M3s worked their way through the pack of cars, biting at the heels of anyone that blocked their way. The clock ticked rapidly as fuel was consumed and the tires wore down. I slowly made my way through turns 10 and 11 before I went to the pits, knowing it wouldn't be long before the cars came in one last time to change drivers and refuel before the race came to an end. It was a closing window, and with each driver being required to spend 45 minutes in the driver's seat, I didn't want to miss my chance to capture the action. When I arrived in the pits, I was given a fire suit. It was then that the experience of the race took an entirely new turn. I found myself in the midst of the action and in the heart of the race. I could feel the tension as the pit crew prepared for the first car to enter, laying out their air hoses on the concrete to ensure maximum speed and minimum interference. 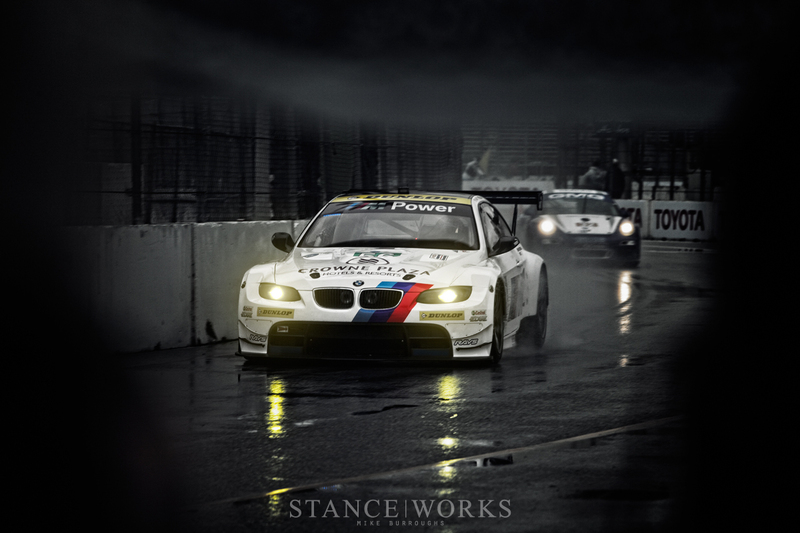 After all, BMW boasts the fastest pit times of any team with an impressive time of 16 seconds. Decisions on whether or not to change tires on the 56 car were pushed until the last possible second; the car was cruising down the pit lane when the call was made to double-stint the tires and send the car to the front of the pack. It was a daring move called just moments before the car pulled up. Joey Hand hopped out and teammate Dirk Müller took his position. Müller blasted back out on to the track and held his own amongst the pack. Jörg was still out on the pavement, pushing the car until the last possible second as the team equipped for his arrival in pit lane. The race's only caution period allowed him to trade the car off to teammate driver Bill Auberlen, a podium finisher in both 2009 and 2010. Unfortunately, the gap caused by the early accident still proved to be a serious burden. Even with four new tires and no need to refuel, the caution period only helped Bill to a certain extent, and his push to the front would prove a struggle. 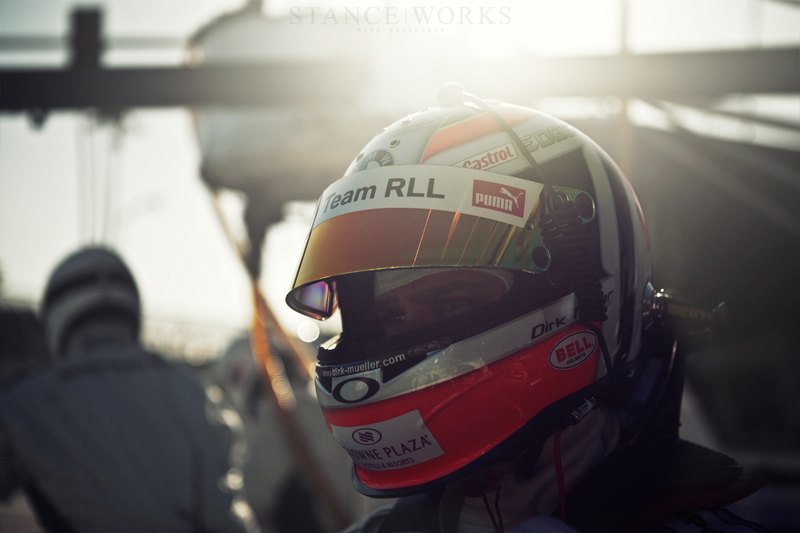 The final 45 minutes of the race ticked by slowly, each second seemed almost an hour as we prayed for the Team RLL to be in front of another car each time they made their way back into view. The 56 car's decision not to change tires proved to be a monumental one, with the Dunlops holding out for an entire second shift. Dirk, making the final stint, said "That race was certainly was another mileage test for Dunlop. Bobby and Chris made the right call and it paid off. I knew I had to go a full stint on tires that had already gone 25 laps so I focused on their management - not what was behind me." Dirk powered forward, making up lost ground. He passed the finish line behind the rival Corvette team, a bitter-sweet way to snag a 2nd-place podium finish. Bill and Jörg were unable to overcome the lost time, putting them in 11th place for the race. Jörg went on to say "It’s disappointing that I got trapped in an accident on the second lap. The Corvette braked very hard and I had nowhere to go. . . . Afterwards the car was still fast. It’s a shame when you have the real potential to win the race and you don’t get any points." 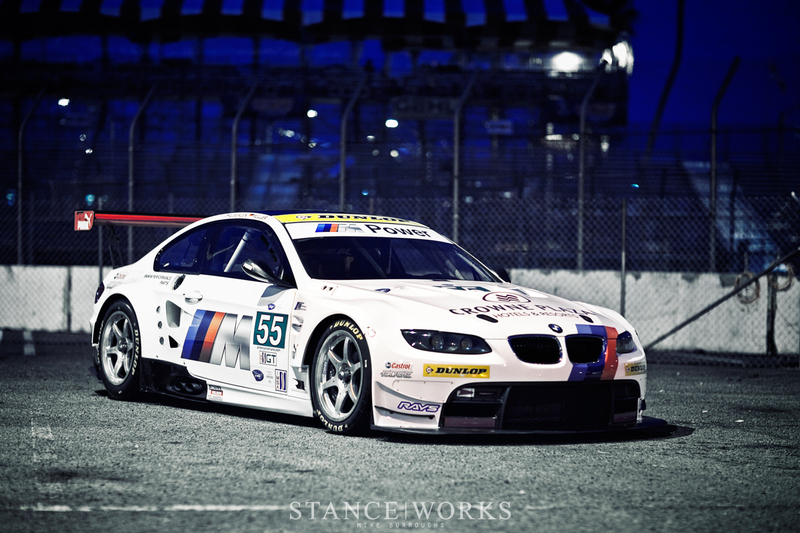 The second-place finish for the 56 car, however, secured BMW Team RLL's position as number one in the GT class. A first-place and second-place finish for the series so far certainly has its benefits. The cars were pushed back to the paddock which had already been mostly torn down; rocks and grit were stuck in the soft compound of the tires as the twins were rolled on to the lifts and retired in to their trailers for their trip back home. Less than a month away, the battle continues at Laguna Seca, where a 6-hour race will decide if BMW contends it's current number-one standing. For Andrew and I, it's a month that we're wanting to go by rather rapidly, as we'll be joining BMW once again. 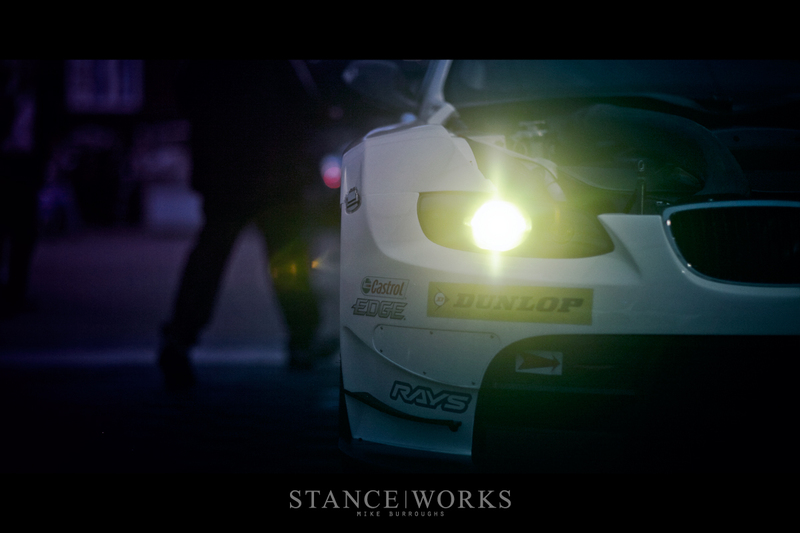 As a dream-come-true to follow, be a part of, and be acknowledged by a team we've held in the highest regard since our youth, it's all part of the ever-expanding nature we're taking with StanceWorks as it grows. 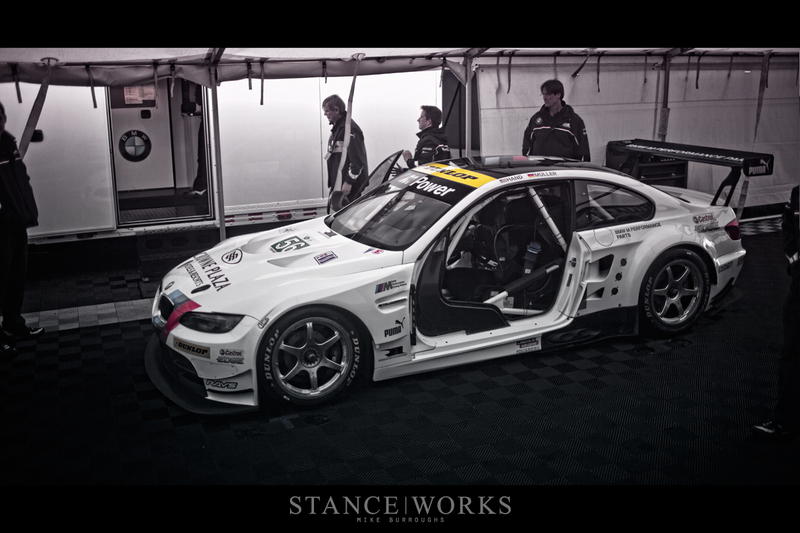 Andrew and I would like to extend a special thank you to Bill Cobb for inviting us to join BMW Team RLL for the weekend. We'd also like to thank Bill, Tom Plucinsky and Kathy Kerber for their hospitality and making us a part of the paddock family this weekend. We're anticipating working with the team in the future! 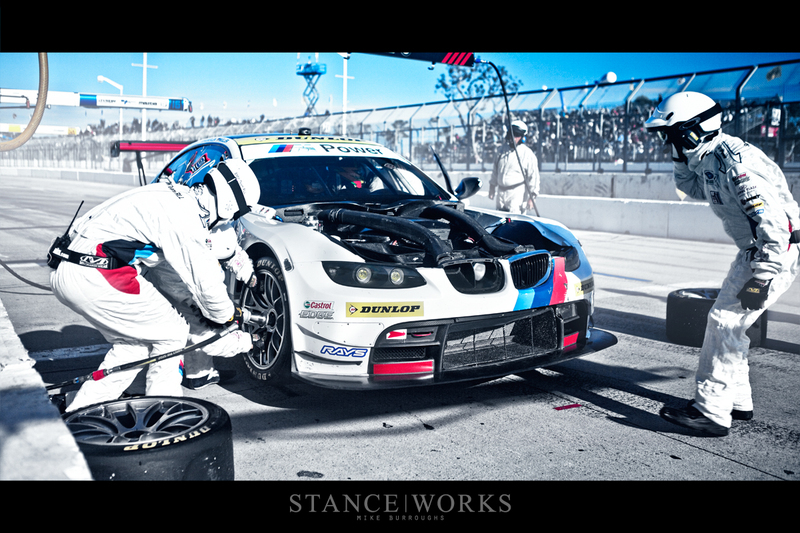 Truly stunning photographs of an incredible car (and team) at an incredible racing series. Thank you.